Mushroom, broccoli, and spinach, mixed with cheese, rolled in pasta, and baked. 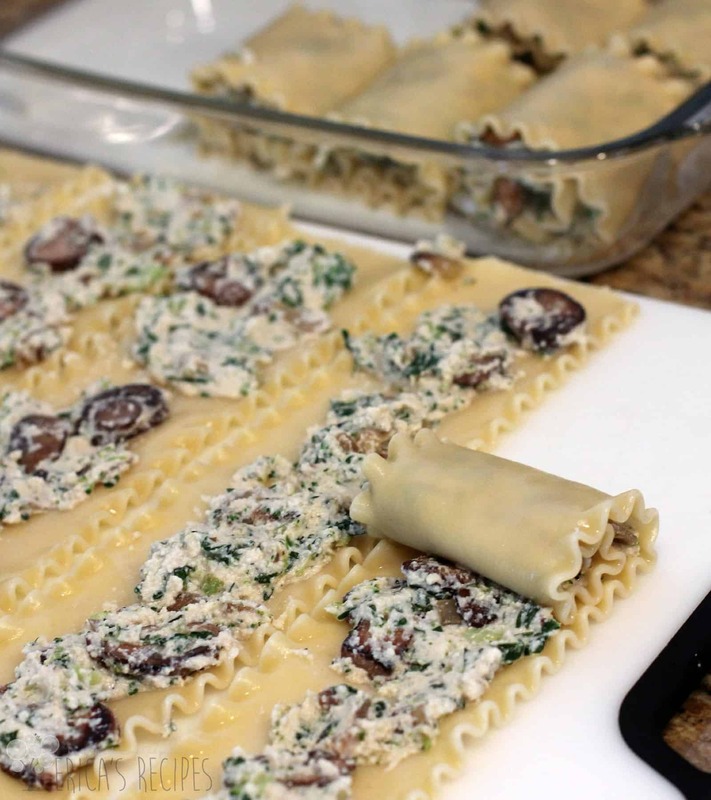 This vegetarian Mushroom, Broccoli, and Spinach Lasagna Roll-ups pasta dinner is not heavy and not greasy. Just delicious comfort food, under a blanket of bechamel. Here is a simple little dinner with cheesy, veggie-filled pasta baked in creamy bechamel. Again, not too heavy – just a nice meal that reheats well too! In the interest of full disclosure, I have made this vegetarian Mushroom, Broccoli, and Spinach Lasagna Roll-ups dish twice. Once with mushrooms and once without. This recipe made its debut on my kitchen table without the mushrooms ….and the recipe needed a little love as they often doooo first time out. So, a couple adjustments later, including adding some juicy shrooms, and we had what you see before you. We were sitting at the dinner table, I was inhaling my dinner very happy with it and pleased with myself, and my daughter suddenly says “you know, I liked this better without the mushrooms. I think they don’t contribute flavor and just add a weird texture”. …sigh. Although that is good commentary for a 12 year old, I disagree completely. But mushrooms are one of those ingredients some people (such as my Mom) stand firmly, forever opposed. So, if you don’t like mushrooms, just leave them out – this will still be a delicious dinner for ya (just cut the olive oil to 1 tablespoon and proceed with the recipe as written). If you like mushrooms, then absolutely, definitely keep them in. Add the remaining veggies to the mushrooms and cook. Combine the veggies with some cheeses and herbs. See? Pretty straightforward. 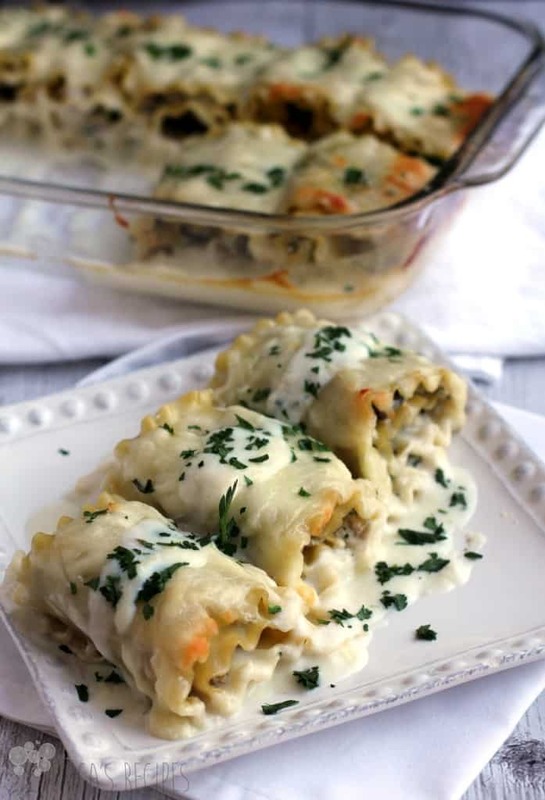 That’s because this recipe is basically a vegetarian lasagna recipe with white sauce, but instead of layering the components, we are making fun pasta roll-ups. So just keep things organized and appoach step-wise, and you can knock it out in no time. Family-friendly, kid friendly (with or without mushrooms). So that’s it folks. A lovely, delicious vegetarian recipe with all the loving comfort of lasagna. In fun pasta rolls! Mushroom, broccoli, and spinach, mixed with cheese, rolled in pasta, and baked. Heat oven to 350F. Bring a large pot of water to a boil. In a large, nonstick pan, heat the olive oil. Add the mushrooms and saute until mushrooms are well browned. Add the onion and garlic and saute until onion turns translucent. Add the broccoli and spinach and cook just until broccoli is fragrant and the spinach is wilted. In a medium mixing bowl, combine the mushroom-broccoli-spinach mixture with the thyme, parsley, parmesan, and ricotta. Season well with salt and pepper (~1/2 t salt, good pinch pepper) to taste. Set aside. In a medium saucepan, heat the butter and flour, whisking until smooth, over medium-high heat. Cook another minute to cook the flour. Slowly whisk in the milk and cook, stirring constantly, 7-8 minutes until thickened. Season with a pinch salt. Set aside. Cook the lasagna noodles to al dente in heavily salted water according to package directions. Drain and rinse with cold water so pasta is cool enough to handle. Ladle ~1/2 c bechamel in a 13x9 baking dish sprayed with cooking spray. On a large cutting board or other clean surface, lay out 6 noodles. Divide half the veggie-ricotta mixture over the pasta, spreading in a layer. Roll up each noodle and place in the baking dish. Repeat with the remaining noodles. Ladle the rest of the bechamel over the lasagna rolls. Top each with mozzarella. Cover baking dish loosely with foil. Bake at 350F for 45 minutes until top is lightly browned. Serve with additional parsley sprinkled over top. Yield: 6 servings. I love the idea of rolling the pasta. It would be so much easier to portion out and freeze extra helpings! Thanks Erica. These look like creamy rolled-up goodness. Lovely recipe. These look great! They would be a fabulous main dish on the Thanksgiving table for vegetarians too. Yum! While I can’t have pasta too often, next time I choose to indulge I would love to try your recipe! Your photos are stunning and I really enjoyed reading your post! 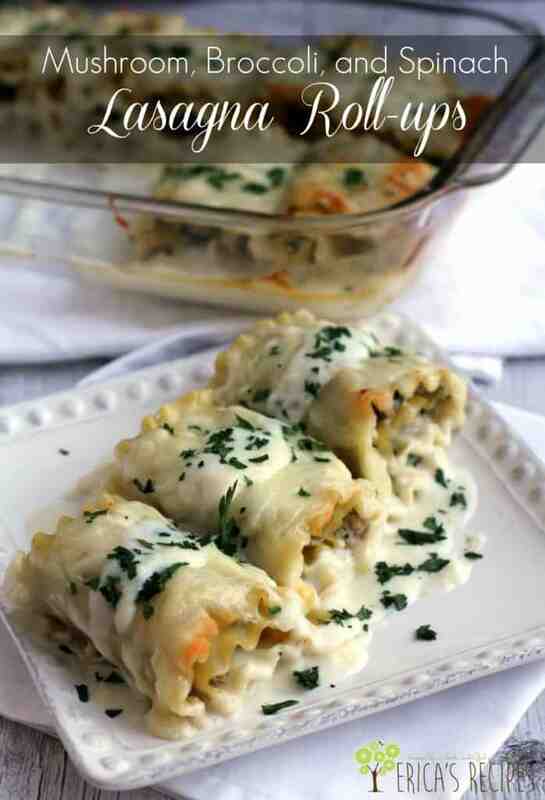 I love these vegetable lasagna! And this creamy sauce on top makes them irresistible! Your recipe for Lasagna roll ups sounds delicious. Don’t feel bad about the mushrooms, I add them in everything and there are times I get the same response. What I love about the roll ups is that you can make extra and freeze it for another meal. Cook once and eat twice! These look really delicious! I love that comment from your daughter…too cute! Oh, mushrooms… you either love them or you hate them. Or sometimes you hate them and then grow to love them, lol! 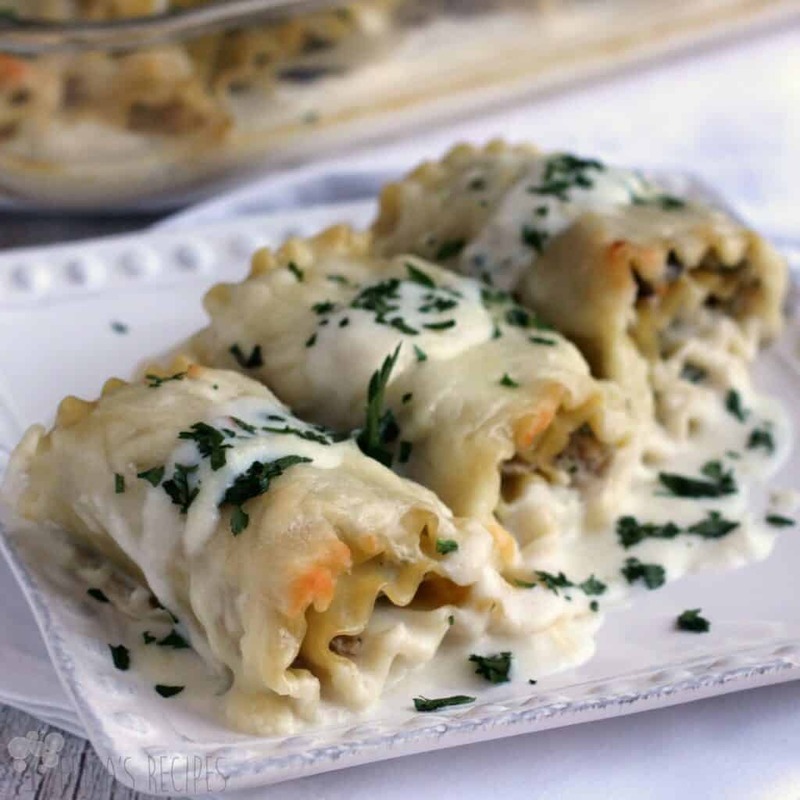 😉 These lasagna roll-ups look amazing! 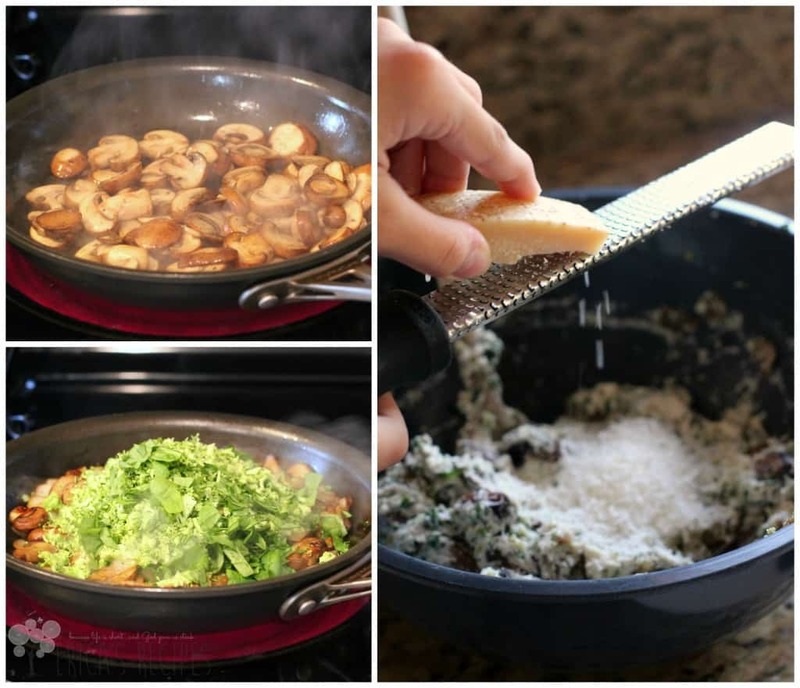 Let me count the reasons I love this recipe ( Mushrooms,spinach, and my beloved broccoli) I surrender—this recipe rocks!!! This is totally my kind of recipe! Love the flavors, especially the mushrooms! Our whole family loves roll ups so I make them as freezer meals quite often. This looks like an exceptional recipe, I can’t wait to try it. Huge fan of mushroom, broccoli, and spinach, and love when I can get so much yummy healthy into my kids! This looks delicious! My mom has never been a fan of mushrooms either, but we love them. 🙂 Definitely pinning to my recipe board! That’s so funny! Everyone’s a food critic haha Sounds like the constructive criticism I get from the hubs once in a while 🙂 My mom stands firmly against mushrooms too, and I just can’t understand it. Mushrooms are soooo gooood! If I serve mom something with ‘shrooms, she picks them out just like a little kid haha I learned not to waste my precious mushrooms on her any longer! This dish looks right up our alley, mushroom and all. Beautiful pictures! I love these, fabulous veggie combo! You had me at mushroom.. these look phenomenal! I LOVE mushrooms and can’t wait to give this recipe a try! 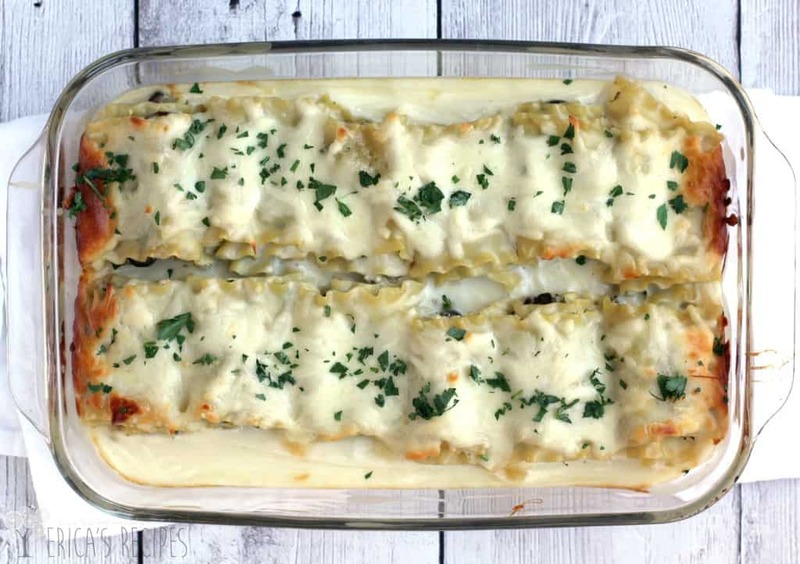 I need to jump on the ‘lasagna roll up’ train, looks too simple not to, and sure looks delicious! Thanks for the great recipe! Love, Love, LOVE!! What a delicious recipe! Can I come over for dinner?! 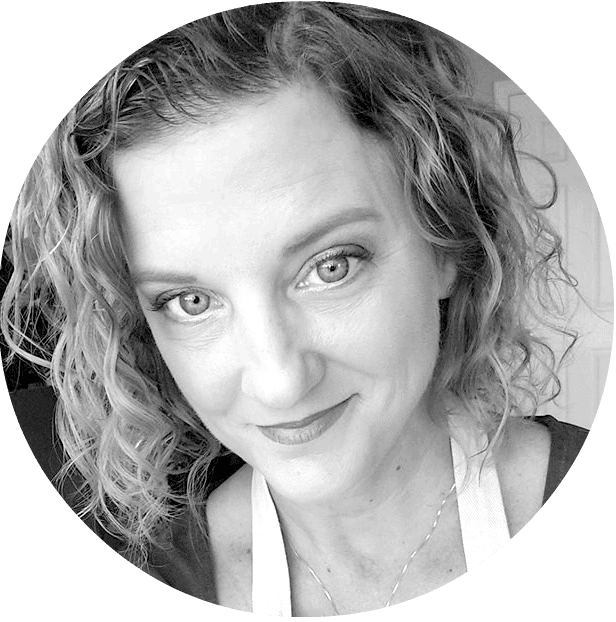 Thank you for sharing it with us at Foodie Fridays…I could just hang out on your blog all day long, going through recipes! Pinning and sharing! And I can’t wait to try it! The directions don’t say when to add the mushrooms. Can you edit it for the cooking and adding the mushrooms? By the way, I made it without the mushrooms b/c I didn’t read in advance and forgot about them but it was still really good. I think another option is add the mushrooms to the sauce. What would be the recommended serving size for a dish like this? I doubled the recipe so I could freeze one pan, and I added crumbled sausage, as my family loves meat! It was absolutely delish!! If anyone is going to add sausage: I bought 6 Italian sausage patties and browned them prior to beginning the rest of the recipe. As the sausage browns, break it up into crumbles. Set the sausage aside and add it to the mushroom/onion/cheese mixture.